Greetings faithful readers! Perhaps it is due to my recent trip to an active volcano, Mt. 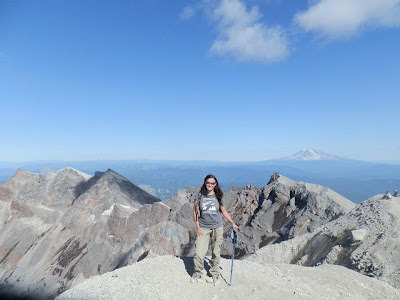 St. Helens, but I felt it would be good to address some geology in today's post. We will be embarking on some shaky ground, so to speak. It has long been known (and quickly forgotten) that earthquakes have regularly occurred on the Pacific coast of North America. From pre-history, up to only decades ago, the coasts of Oregon, Washington, northern California and Alaska have been at the mercy of the temperamental Cascadia fault. What is the Cascadia fault? It is a product of plate tectonics, one of the primary causes of earthquakes, and volcanic activity across the globe. For those of us who don't remember all of our geology (I know I didn't), the earth's surface is made up of a series of different zones that compose its surface. A simple diagram of the earth's surface and core. The lithosphere- the uppermost layers of the earth's surface- are what cause tectonic activity to occur. The very upper layer, called the lithosphere, is what we most often think of as the earth's surface. It is composed of the crust and the uppermost part of the mantle. It is also incredibly thin when considering the earth's diameter as a whole. Because our earth's lithosphere is less dense than the asthenosphere found below it, it tends to float dynamically on top of it. 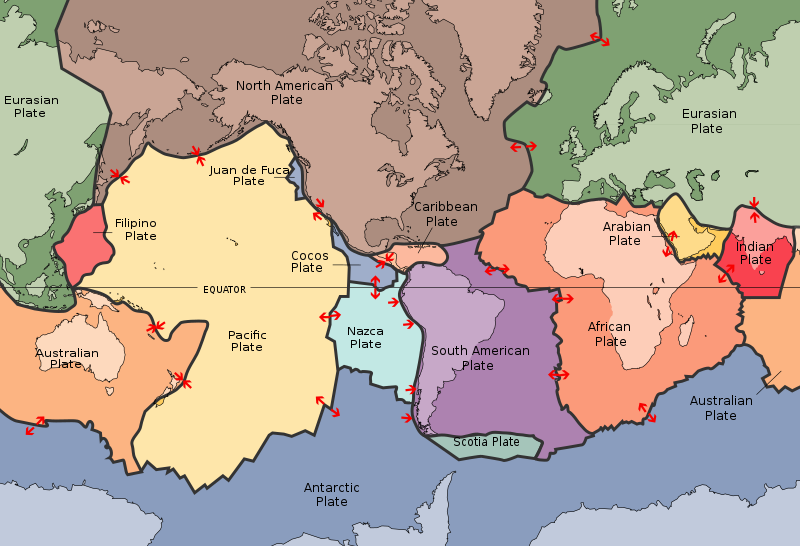 The lithosphere can be divided into a series of tectonic plates- seven or eight relatively large, and several small. The total number is still somewhat under debate. The plates are always slightly moving in generally consistent directions, as shown above. Plates moving together are creating mountains and ocean ridges- this is known as convergence. Plates moving apart are diverging- this can form features such as ocean trenches. The last type- transformative faults, neither create nor destroy, and are usually joined with one of the other two types of faults. In the case of our Cascadia fault, the North American Continental Plate (brown, above) is in fact overriding the Juan de Fuca plate (essentially the oceanic crust), shoving it under in a process called subduction. As a result, we have a very nice cascade mountain range with many amazing volcanic and mountainous features along it. This zone is approximately seven hundred miles long, and stretches from northern California onto Alaska. Pacific Northwesterners may not know that a majority of our beautiful landmarks are in fact due to volcanic activity. From Mt. St. Helens to the Three Sisters, all of these giants have blown their top at some point. Even one of our proudest state symbols, Crater Lake, was formed approximately 7,700 years ago when the 12,000 foot tall Mount Mazama erupted and sank into the earth. The resultant caldera is the deepest lake in the US. So with the beauty of these volcanic features comes a price- eruptions earthquakes, and tsunamis. The USGS is doing its very best to catalog information and predict when the next volcanic eruption or earthquake may strike. The truth is, this is very hard to do. One of the best ways to predict what might happen in the future is to look at what has occurred in the past, and estimate the probability of similar events happening again. How can you do this? If you are looking into prehistoric times, you can always use geographic features to pinpoint times and locations of major events. Another neat way to do some detective work is through the oral or written histories of people who lived in the fault zone in the past. Approximately 12 events have happened in the last 7,000 years on the Cascadia fault line. On average, these events happened every 580 years, but varied from periods of hundreds to over a thousand years. Using geological evidence, these events can be determined within a resolution of a few decades, but can be pinpointed using oral and historical records. 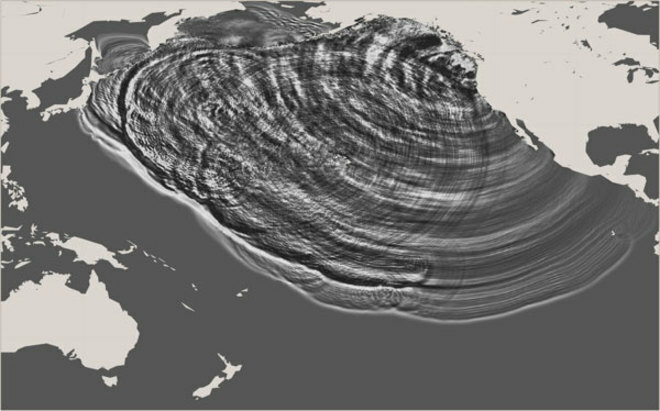 The most recent Cascadia earthquake was approximately 300 years ago, between 1699 and 1700 AD. Further examination of estuaries in the area of southern Oregon have shown evidence of tsunamis. (For full information, read "Great Cascadia earthquakes and tsunamis of the past 6700 years, Coquille River estuary, southern coastal Oregon" by Witter et al. 1950). From Japanese fishermen's records, scientists were able to deduce the event of a smaller tsunami in 1700- but no evidence of an earthquake. Because of this, they assumed the epicenter of the event was elsewhere. Using modelling, deductive reasoning, and geology, they were able to narrow down the source as the Cascadia Fault in North America. In 869, a large earthquake/tsunami event (estimated 8.6 in magnitude) occurred in Japan, known as the 869 Jogan Sanriku earthquake. Interestingly, this event was directly recorded in a history text called Nihon Sandai Jitsuroku, which was compiled in the year 901 AD. One more recent earthquake that some might remember is the 1964 Great Alaskan Earthquake, along the Cascadia Fault. Lasting four minutes, this was the strongest recorded earthquake in North American history at a magnitude of 9.2. 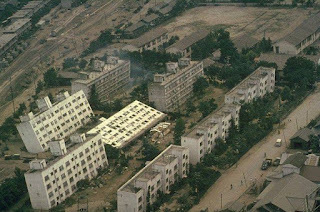 The powerful nature of the quake caused soil liquefaction- a dangerous phenomenon in which water-saturated soils or sands vibrate apart and are filled in between with water- resulting in a much less stable surface, and often in the collapse of geologic features or buildings. Much like sifting flour, liquefaction creates a less dense and unstable substrate. Collapsed buildings after the 1964 Alaska Earthquake, due to the liquefaction of soils. Alaska had many earthquakes before this, but records are somewhat spotty prior to the 1700's. Most recorded earthquakes were magnitude 7 or above. Yakutat Bay is also an active area, and was the epicenter of two earthquakes on September 10, 1899. So what do Alaska, Oregon, Washington, and Japan all have in common? 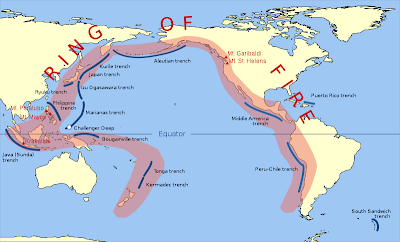 They are all found within the Ring of Fire- a ring of tectonic boundaries that is home to 452 of the world's active volcanoes and over 75% of the world's active and dormant volcanoes combined. 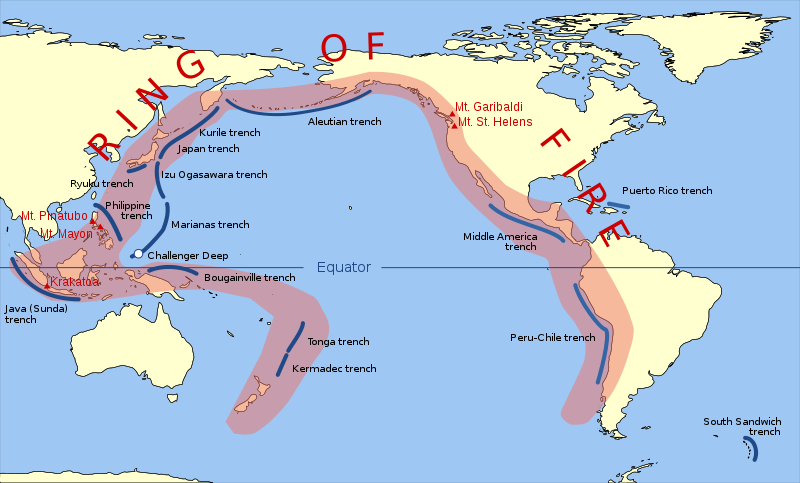 Even better, 90% of the world's earthquakes occur within the Ring of Fire (http://earthquake.usgs.gov/learn/glossary/?termID=150). Where does this put us? Scientists are constantly trying to figure this out. Scientists at Oregon State University recently completed a 13-year study on the Cascadia fault. According to their findings, the southern boundary of the Cascadia Fault is much more active than the northern end (Newport, Oregon to Vancouver Island). The researchers concluded that there is quite a large probability (40%) of an earthquake in the southern Oregon region in the next 50 years. The massive report concludes with the fact that if a Cascadia earthquake doesn't occur by 2060, we have exceeded 85% of all gaps in earthquake occurrences along the Cascadia Fault in the last 10,000 years. So, quite frankly, we are overdue. Disaster preparedness: What can you do? How is the government preparing? Japan versus Cascadia - will we do better or worse? The author at the summit of Mt. St. Helens.